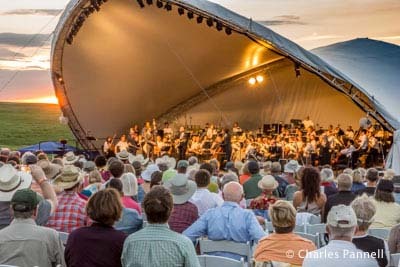 A eclectic mixture of classical music and cowboy culture, the Symphony in the Flint Hills (www.symphonyintheflinthills.org) celebrates the history, ecology and culture of the last stand of native tallgrass prairie. Now in its eleventh year, this popular event moves to a different site in the Flint Hills of Kansas every year. The 2016 concert will be held on Edward Bass’s South Clements Pasture in Chase County on June 11, 2016. And although things are a little different every year, access was figured into the equation from the get-go, so everyone can join in on the fun. The concert – which is the highlight of the day – begins around 6 P.M.; but plan to arrive in the early afternoon, as there’s plenty of other activities to enjoy. Plus you’ll need time to actually get to the site. Part of the beauty of this event is that you don’t just drive up and hop out at the venue. 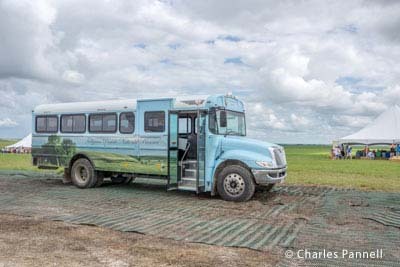 Instead, you’ll be treated to a leisurely walk or wagon ride through the pristine tallgrass prairie. And if the walk is too long, or you can’t manage the step up into the wagon, no worries – accessible transportation is also available. The concert site itself is a virtual tent city, with the massive stage set behind it. 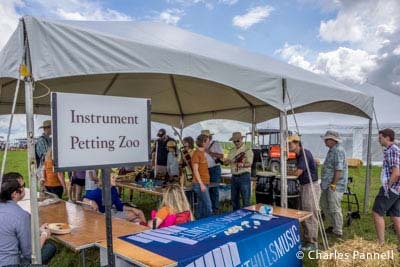 There’s level access to all the tents, which feature educational lectures about the disappearing grasslands, a silent art auction, adult libations, and a scrumptious pulled pork dinner with all the trimmings. Accessible porta-potties are located nearby, and there’s a golf cart shuttle for folks who can’t manage the distance between the tents. There’s open seating for the concert, but there is a special ADA seating area set aside. You can bring you own lawn chair, rent a chair at the event, or just bring a blanket and set up camp on the ground. No matter where you sit, you’ll never forget the experience of listening to the music of the Kansas City Symphony Orchestra set against the backdrop of the tallgrass prairie. As the sun sets, cowboys appear on the horizon, and then slowly make their way down to the stage area; and when the show nears an end they ride off into the distance. It’s probably the only symphony performance where you’ll feel comfortable in blue jeans and cowboy boots. And in keeping with tradition, it concludes with a rousing Home on the Range sing along. Afterwards, guests are welcome to linger on and enjoy the night sky, or maybe listen in on the story circle, or indulge in a little dancing. Whatever you choice, you’ll have a full day of fun on the beautiful Kansas prairie. Tickets for the 2016 Symphony in the Flint Hills will go on sale on March 5, 2016. General admission tickets are $94 for adults and $50 for children under 12. Plan ahead though as tickets go like hotcakes, and this popular event sells out every year.